To draw the Seven of Cups in a reading shows that you need to clearly see the shadows and visions in your imagination, not only in your dreams but also in the real world. You should be careful of wishful thinking and be alert of the choices that you make. In one sense, the Seven of Cups indicates that you are a dreamer who is both excited and afraid of the things that you see in your unconscious. 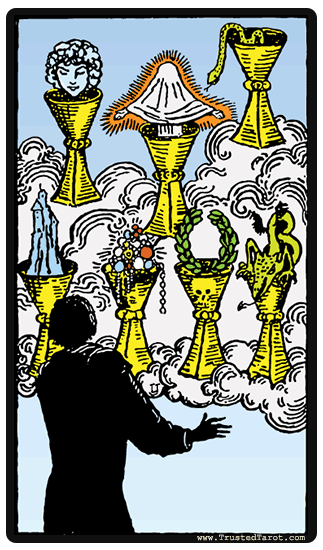 In another, the Seven of Cups is a reminder that although it is good to have dreams and wishes, it is even better to take action attaining those dreams. At one point in life, you will need to stop fantasizing and face the reality of life. If you are unable to make a decision due to the many options that are available, you should evaluate the advantages and disadvantages of each option so as to make the best choice. It is important to exercise caution when you are making your decision, as the card itself seems to show there is not only wonders and treasures that are available to you, but also monsters and shadows. There are some cases when the Seven of Cups may show that you are living in ways that are not necessarily grounded in real life - that your actions are guided by illusions that you feed yourself. Your ideas may be so up in the clouds, developed only on your imagination. As such, you will need to separate what is real and what is not so that you can make better choices. You will need to separate what is real and what is not so that you can make better choices. The Seven of Cups is also linked with temptation. This applies in the upright meaning and also the Seven of Cups reversal meaning. The Seven of Cups reversal is somewhat similar to the upright, as they both indicate dreams, illusions and temptations, but seem to emphasize the more negative qualities of this card. Your views may be inclined towards fantasy, and not grounded in reality. It may imply that you are unclear about the things that you are searching for. The Seven of Cups reversed may also demonstrates your unwillingness to face the realities of life, and you are seeking to escape through imagination and daydreaming. On the other hand, the Seven of Cups reversed may also indicate an end of confusion, of cutting out illusions, and moving forward with clarity.